1) What is the book called? Bad Kitty Gets a Bath. 2) What is the book about? Who are the main characters? A cat that has a bath and she does not like it. 3) What was your favourite part of the book? When they get really smelly while they are outside for a long time. 4) What was the funniest part of the book? When he is wet. At that moment he was really mad. 5) What did you learn from reading the book? If I was a cat don’t have a bath. But how do cats get clean? 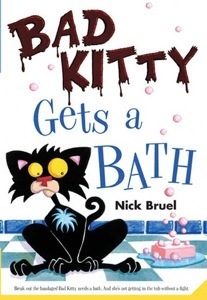 Hi Cole That sounds like a very funny story, maybe you could draw a picture of the cat in the bath.